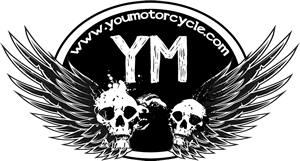 Home / Reviews / Product Reviews / Motorcycle Trailer Accessories You Need – Towing Tuesdays! A motorcycle is the ultimate escapemobile, and on it you will always be able to vanish at a moment’s notice. 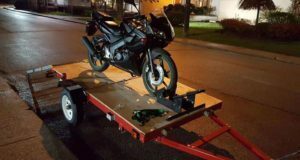 The right motorcycle trailer and motorcycle trailer accessories can help. But let’s be honest. In this world time is a rare luxury. The week or two of vacation time your job allows you isn’t enough to ride all of the places you’d like to. Sure, you might have enough time to ride your motorcycle to your destination, but will you have enough time left to enjoy it before it’s time to turn around and head back home? Whether you’ve been riding for ages or are brand new to motorcycling, a motorcycle trailer will let you get out further and bring a friend or few to share the driving. You’ll enjoy your motorcycle adventures that much more, together. So go ahead, take your bikes to some place new, set up a camp, see things you’ve never seen before, and spend the next few days on two wheels. Here’s a list of everything you need to get you to your goals – and don’t let anyone say you won’t get there. First, let’s start with making sure you have the right trailer for your needs. Are you more concerned with space, or would you rather make sure you have enough trailer to haul two bikes at once? Do you need some combination of compactness and serious hauling capabilities? You’ve got this. 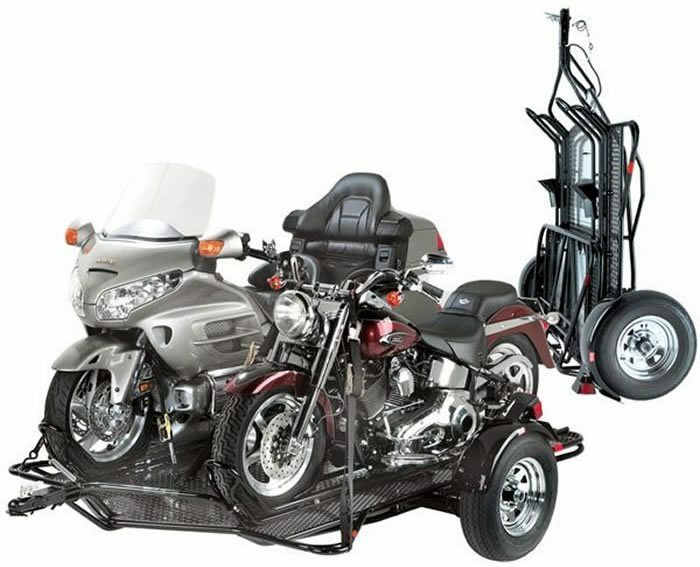 If space is your primary concern, you should check out the Port-A-Chopper™ Motorcycle Trailer. 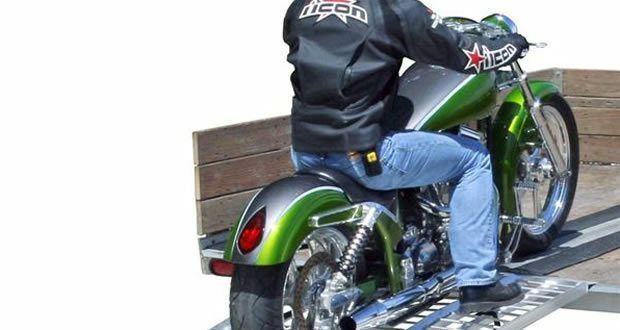 It’s a motorcycle trailer that can be built and taken apart in 15 minutes. All of the components fit in a hockey bag in the trunk of your car. That means you can pack up your bike and hit the road for your next adventure within an hour of deciding where to go. Ideally though, travelling with a friend is the dream, especially if said attractive friend can bring his or her motorcycle and split some of the driving with you. You can cover greater distances much faster, and when you do need it, having a motorcycle trailer big enough to haul two bikes will make you a local hero. Enter the Kendon® Stand-Up™ Dual Motorcycle Trailer. It comes out of the box with two wheel chocks and two rails designed for hauling two motorcycles simultaneously. Adrian’s Tip on Small Spaces: If space is still a concern, the Kendon stand-up motorcycle trailer can shrink down in floor space by being folded over and standing up. In this position it takes up only a small footprint in your garage. Let’s assume you already have a trailer, or have been following our suggestions and building your own. You’re going to need some straps to hold your motorcycle down. Rule #1 in towing is never go cheap on your straps. 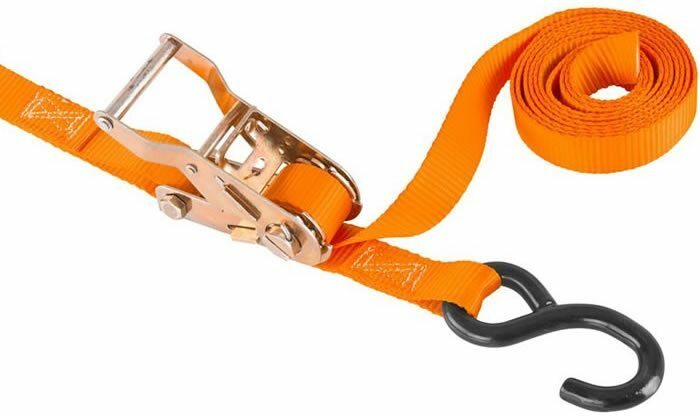 Straps typically come with two ratings: working load limit, and break strength. Working load limit is the safest maximum working load of a strap as designed by the manufacturer. You can exceed the working load limit, but it’s not recommended. The working load limits are typically well below the maximum break strength, which is maximum stress or pull a strap can take before breaking. When buying straps, look for both the working load limit, as well as for the break strength. If only one number is given, this is probably the break strength. The manufacturer or seller may be trying to cover up what is really a weak strap. Always remember Rule #1 in towing, and never go cheap on your straps. Go for something clearly indicated and still affordable, like this 4-pack of 4-pack of 1,000 lb capacity ratchet straps for $26.99. Adrian’s Tip on Ratcheting Straps Versus Cam Straps: Make sure you get ratcheting straps. Both ratchet straps and cam straps come with many fittings, from D-Rings and E-Track Fittings to S-Hooks, but ratchet straps are much stronger. If you’re towing something fragile that could shatter under pressure, go with a cam strap. For motorcycles, you’ll need ratcheting straps. They give you a point on your motorcycle to easily and securely hook your ratchet straps to. They help you to avoid any damage on cables or brake lines at your handlebar as they take the point of contact of the ratcheting straps away from anywhere damage could be caused. 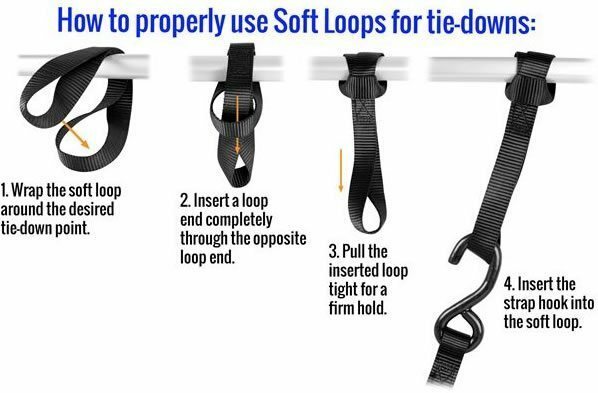 On supersports and other street bikes with front fairings the soft loops help your straps to clear wide of the bike, which avoids damage from the scraps scuffing while towing. At $6.99 for two these things pay for themselves on the very first tow and have a 1,000 lb working load limit and 4,500 lb break strength for peace of mind. Adrian’s Tip on Supersport Fairing Clearance: Supersport and other street motorcycles have fairings that can stick out beyond where you can safely wrap a soft loop. This puts the fairings at risk of scuffing from the S-Hook. To get out further, simply loop a second soft loop through the first one. Crisis avoided. Wheel chocks help keep your bike balanced while you strap them down. Some wheel chocks even use the motorcycle’s own weight to lock the bike in a vertical position while you work. Whether you’re towing your dirt bike five hours away, or towing your cruiser to the shop, it’s important to have the right wheel chock for the job. Here are three picks to help you decide what’s right for you. 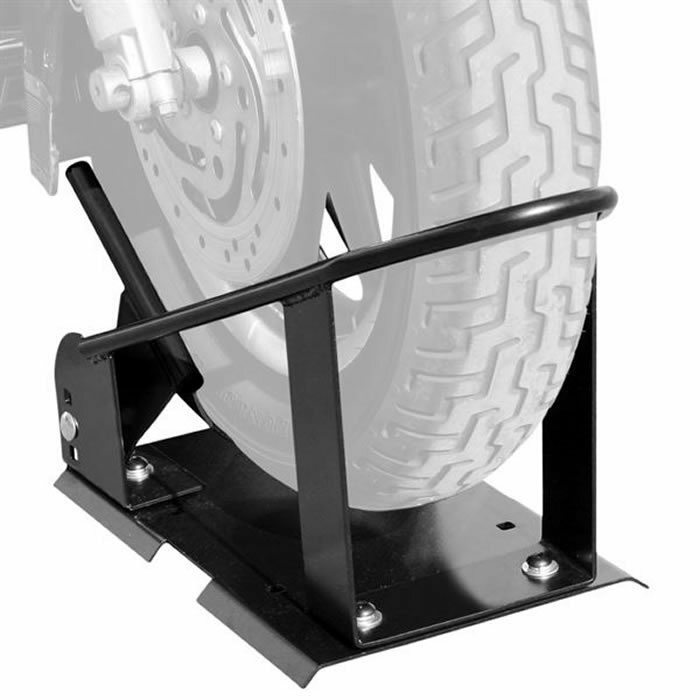 Truck owner who don’t want to drill holes into their beds can get a bolt-free, drill-free motorcycle wheel chock that we recently reviewed. It works on truck or trailer beds up to 7′ wide. At only 20 lbs, it’s a light weight alternative for the person who can’t commit to drilling down a chock. The traditional wheel chock is a classic. You can adjust the nuts and bolts on the fly to make the wheel chock compatible with a wide variety of motorcycles and tire sizes. At under $100 shipped to your door for a chock that will hold your bike upright, it’s a no-brainer. The Langston Racing Two-Way Dirt Bike Wheel Chock is another versatile chock perfect for the motocross or supercross enthusiast. The chock can be adjusted between two positions. 8″ to 12″ tires in one position, or 14″ to 21″ tires in the other position. Pit bikes to dirt bikes + one self-locking chock = zero problems. Adrian’s Tip on a Makeshift Removable Wheelchock: You can make a traditional wheel chock quickly removable by securing it with wing nuts. Wing nuts are quick and easy to tighten by hand, making installation and take-off quick and painless. 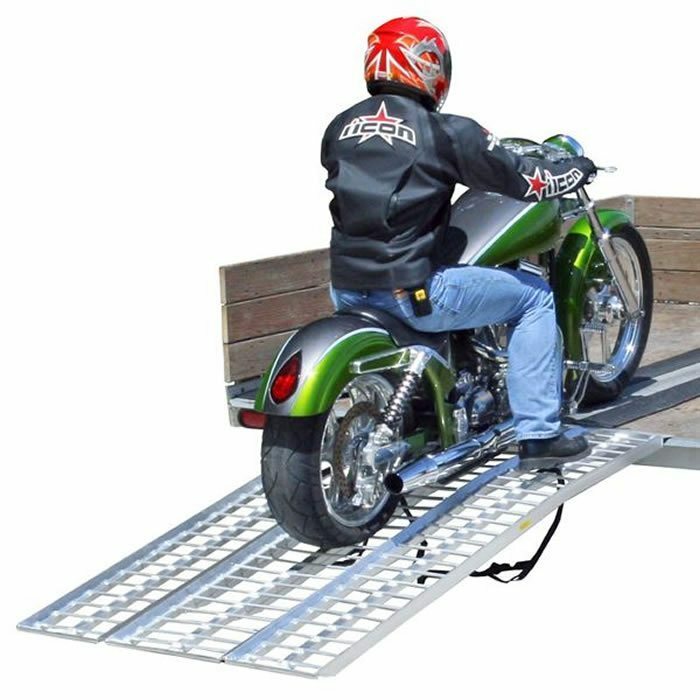 A 5′ long motorcycle ramp like this one is extremely light weight. It’s made from aluminum and does not rust. It’s wide enough that you can confidently ride or push your bike right up. Without fear of being in a #FAIL video on YouTube. There are downsides to a 5′ motorcycle ramp. 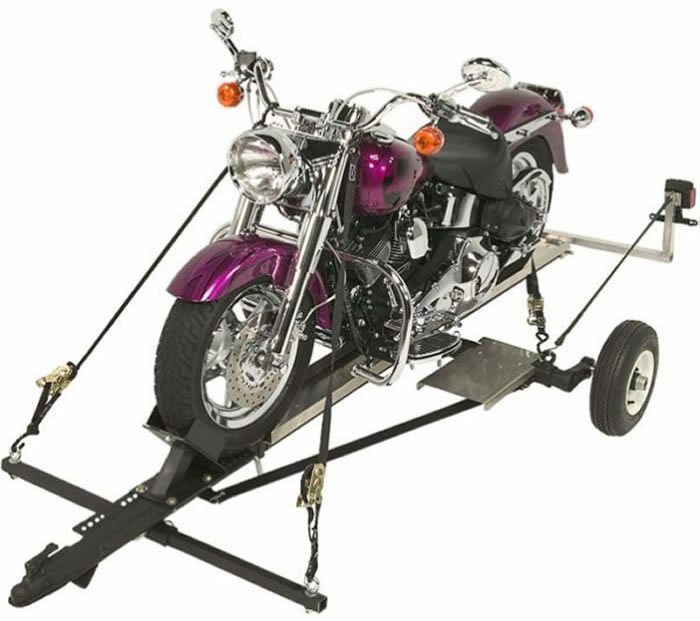 Long and low bikes, like the Harley-Davidson Low Rider, bottom out if the trailer is too high off the ground or if the angle of the incline is too steep. For that reason, I personally went with the 7′ long M-Series Aluminum Non-Folding Arched Motorcycle Ramp. We’ll be reviewing it in next week’s Towing Tuesdays! so stay tuned for that. Adrian’s Tip on Ramps: Arched ramps help reduce incline angles which helps ground clearance. This helps to prevent your motorcycle from bottoming out as you go up or down the ramp. For added confidence, get an arched ramp like the M-Series. With a trailer you can cover more distance in less time, with or without a friend, so get the right motorcycle trailer accessories. Your trailer will get you where you want to be riding. And it will get your favorite machine there safely too. What you do when you get there is up to you. Big thanks to DiscountRamps for letting me use their product images!